Long before the U.S. entered World War II, Presi­dent Franklin D. Roose­velt began unra­veling Con­gres­sional legis­la­tion that had hin­dered his aiding Great Britain and other Western demo­cra­cies in their armed con­flict with Nazi tyranny. Four suc­ces­sive Neu­trality Acts from the 1930s were un­done with “help” from two Ger­man U‑boat attacks on U.S. Navy ships in the North Atlantic off Ice­land, and FDR’s Lend-Lease bill, approved by Con­gress on March 11, 1941, began “lending” arms and mate­rial to the British even though the U.S. tech­ni­cally remained neu­tral. On this date in 1941 Roose­velt dis­patched Amer­i­can forces to occupy the Carib­bean island of Trini­dad, British Gui­ana in South America, and the Danish depen­dency of Ice­land. The two British pos­ses­sions, Trini­dad and British Gui­ana, were stra­tegically signi­fi­cant because of Vene­zuelan oil fields in the south­east and the U.S.-owned Pana­ma Canal in the south­west. Ice­land, viewed as part of America’s defense of the west­ern Atlantic, approved the arrange­ment where­by troops of a neu­tral nation—that is, the U.S.—would be per­mitted to station armed forces on its soil in place of troops from a bel­lig­er­ent country. The bel­lig­er­ent country was Great Britain, which had sta­tioned troops in Ice­land and patrolled Ice­landic waters to pre­vent Ger­many from over­running the is­land after it had over­run the mother coun­try the year before. Three months earlier, in April 1941, FDR had sent troops to occupy the Danish depen­dency of Green­land, the lightly settled land­mass east of Canada. These occu­pa­tions were made under the imagi­na­tive guise that the terri­tories fell under the um­brel­la of the cen­tury-old Mon­roe Doc­trine. The U.S. move was to pre­vent, in the words of the pre­si­dent (who also happened to be the com­man­der-in-chief), the occu­pa­tion by Ger­many of stra­tegic out­posts that could be used as air or naval bases for even­tual attack against nations in the West­ern Hemi­sphere. Amer­i­can air and naval assets on Green­land and Ice­land moved the U.S. closer to sup­porting Great Britain in its Battle of the Atlantic—which became the longest-running (six years), most com­plex cam­paign of the war—because now U.S. Navy ves­sels could extend their patrols to these two island terri­tories, both laying along the fragile oceanic life­line between the U.S. and Britain. 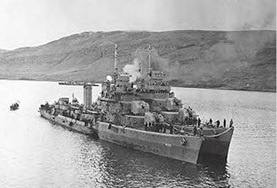 Left: USS Kearny at Reykjavík, Iceland, two days after being tor­pedoed by U‑568 on October 17, 1941. The USS Mons­sen is along­side. The tor­pedo hole is clearly visi­ble in Kearny’s star­board side. The Kearny, assisting three other U.S. de­stroyers, came to the res­cue of a belea­guered con­voy whose Cana­dian escorts were being mauled by a U-boat wolf pack when it came under attack. Casual­ties among Kearny’s crew included 11 dead and 22 in­jured. Roose­velt told the Ameri­can pub­lic that “we do not pro­pose to take this [attack] lying down.” He asked Con­gress to autho­rize the arming of Ameri­can mer­chant ships, one of many mile­posts he planted on the road to mobi­lizing the nation for war in 1941. 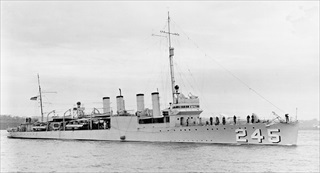 Right: The USS Reuben James—a four-funnel, post-World War I de­stroyer—was the second U.S. Navy ship sunk by hos­tile action in World War II. (The first was the USS Panay, a Yangtze (China) river gun­boat sunk by Japa­nese air­craft on Decem­ber 12, 1937.) The sinking of the Reu­ben James off Ice­land on Octo­ber 30, 1941, with the loss of 115 lives, prompted Con­gress, on Novem­ber 17, 1941, to lift the last pro­vi­sions of the archaic 1930s Neu­trality Laws. The U.S. was three weeks short of being drawn into war with Imperial Japan, Nazi Germany, and Fascist Italy.